Cold-weather running isn't my thing. I mean, I get it -- it's very, very few people's "thing." But I truly detest it ... until I get started. Going outside for hours when it's freezing and windy is not the most welcoming workout. And this past week wasn't even that cold -- in fact, this rainy Sunday was down right balmy. Yet cold weather makes it tough for me to get motivated and head out the door. Each time, I yearn for warmth as I add what feels like a dozen layers, stretch my tight, chilly muscles and bundle up for a brisk air bludgeoning. And then I start running, warm up and immediately forget about my aversion to running outside. The frigid air jolts my body in a refreshing way. Overall, my hatred for running in the cold isn't about motivation. I love running! I'm just a weather wimp ... and perhaps this past week was difficult in contrast to my warm, sunny runs from last week. Not running outside is pretty easy for me too. There are treadmills in my apartment building. The treadmills are pretty nice, almost always available and connected to a television -- hello "House Hunters" while I run! So sometimes it's a no brainer to log indoor miles. All this to say that this week's workout recap included a lot more treadmill runs than I would have preferred. While I love the treadmill, I'd much rather include a nice mix of treadmill and outdoor running. This week heavily favored the indoor workouts. As it warms up, I'll head outside more often -- I think I get a better workout when I run outside; I tend to push myself a bit more and disconnect from the phone and TV. Running outside, whatever the weather, is a chance to clear my mind and let my legs carry my down the street. And with more than a month until the first day of spring, here's hoping I buck up even if there's not a warm up. Monday: Elliptical for 40 minutes. It was a late-night, squeeze-in-before-I-went-to-bed workout after I returned from a weekend of traveling. Tuesday: Track workout: 1.5 miles at race pace with a 3-minute jog; 6 x .25 mile with 1-minute jog. Wednesday: 4.5 miles (on the treadmill). It was another days of rushing to get in some morning miles before a busy day. Thursday: Elliptical for 45 minutes. Friday: My lone outdoor run -- 6 miles in 29-degree weather. Brrrrrrr. In reality it was super nice once I got started and I was glad I took my run outside. I took the miles easy and relaxed and it was a beautiful start to the weekend! Sunday: 8 miles on the treadmill. After another weekend of traveling -- this time Philadelphia to visit friends, I waited far too long in the day to start my miles. By the time I made it back home Sunday, unpacked, ate a quick bite and relaxed a bit, the sun had set and my motivation for a outdoor run had dwindled. Even through I resorted to the treadmill, it was an excellent opportunity to catch up on the Olympics! Now that's some cold weather! 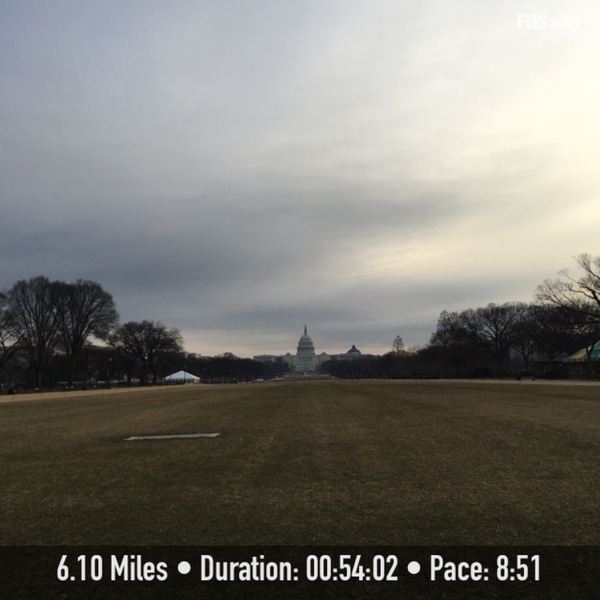 Check back for future weekly training recaps, and see others who are sharing their training adventures on the Cherry Blossom Ten Miler's Link Up page.